Vidya Vox, the mashup sensation and YouTube superstar with over 3.4 million subscribers is coming back to India with Radio Mirchi with a series of live concerts in six cities! One of her latest scintillating originals “Kuthu Fire” has garnered more than 9 million views, since it’s release in March. “Diamonds” another of her singles from the Kuthu Fire – EP has left her fans raving. Her popular mashups include, “Closer” and “Kabira” for which she had a collaboration with the pop singer-songwriter Casey Breves. Get your tickets on BookMyShow NOW! 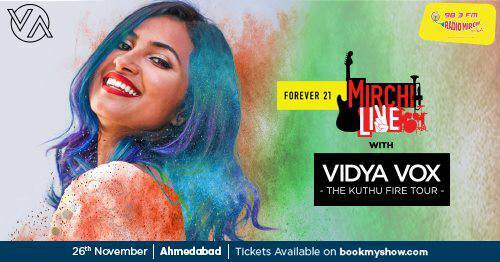 Come sing and dance with Vidya Vox on the #KuthuFireTour.